Mo-Chica: A Peruvian Oasis in South L.A.
About a little more than three weeks ago, you may have gotten the Blackboard Eats code for 30% off Mo-Chica. You may have gotten it because you’ve heard about Chef Ricardo Zarate. 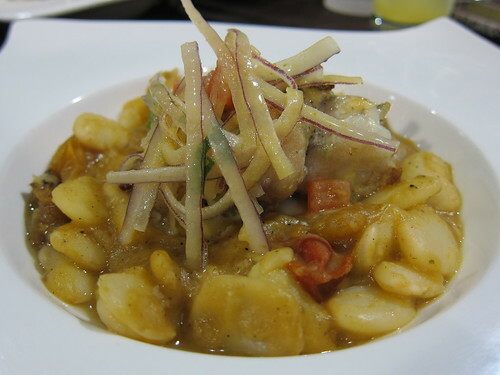 You may have gotten it because you were curious about Peruvian food. Well if there were a legit Blackboard Eats post that I ever wrote with urgency, let it be this one because your Mo-Chica code is about to expire this weekend. To start off, there are few things that will draw me into Trojan Land. No, I don’t harbor Trojan bittnerness as a Westwood-bred Bruin; it’s just like anything else. It better be for something specific. Like soul food. Or Chanos. Or the start of The Great Walk of LA. A Revlon Run-Walk or Nike event. Or yes, now: Mo-Chica. Ask Caroline – she was a little skeeved, though neither of us were familiar with the Mercado Paloma marketplace, a food court of sorts. Nancy, who wrote the Mo-Chica post on Caroline’s blog,Â was a pro, though, as a Trojan. Each entree averages around $10 – which, considering the food, is quite a bargain for how much flavor Mo-Chica packs in each dish. I was especially impressed with the range of dishes with not even a consequence of nutrition value guilt. No dish was particularly heavy, and the thought that I was missing out never occurred to me. I was full, all right, while wanting to chase more tastebud titillations if only I had the capacity to digest them, too. The dishes, which centered around seafood, were perfectly executed in flavor and even portion…you wanted just another bite but knew that the next dish lay just around the corner. That’s how good Mo-Chica is. 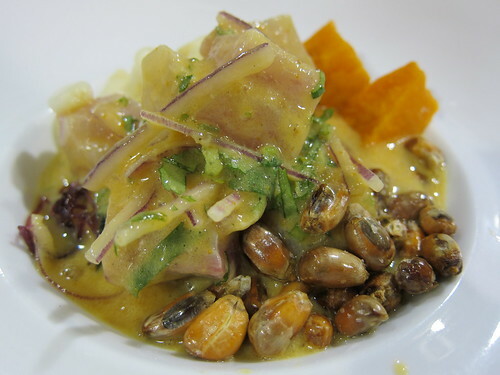 After all, it’s probably no accident that it’s a repeat mention for @thejgold, who also named it as the Best Peruvian Ceviche he’s had outside of Peru. First things first, I need to visit Peru. I’ll take Mo-Chica – the contemporary equivalent – in the meantime. 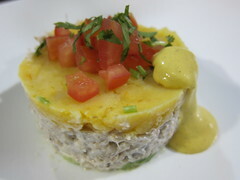 Because I had read about the Ceviche and the Causa – both of which were indeed mind-blowing. 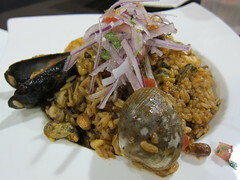 But nothing was to prepare me for the Arroz Con Marisco, which was so packed with seafood in every bite (tiny clams especially), I couldn’t believe how deliciously hearty this rice dish was for the flavor and value. I might have to order this dish every time I return, just so I’m sure not to miss any seafood goodness (I am always a seafood pasta kind of girl when in Italy, too). The special that we ordered this night went beyond our expectations – and I never remember ever having liked Fava Beans as much as I did at Mo-Chica. The fish was perfectly cooked and tender and the sauce had a ton of flavor which bordered on a kind of curry. The texture of the dish had a nice gumminess thanks to the beans, and it became clear that this was a main dish, an entree. 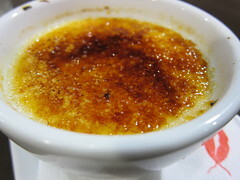 For dessert: Get the passion fruit creme brulee. The top layer was thankfully perfectly torched in our rendition, and the consistency of the custard was super creamy, dense and packed a whole lot of passion fruit flavor. Divine. So don’t let this Blackboard Eats code go to waste. The entrees average about $10 with the appetizers starting at half that; apply the 30% off and you are in contemporary Peruvian heaven at a bargain. This entry was posted in Deals, Food, South LA and tagged Blackboard Eats, causa, ceviche, contemporary, Downtown LA, Food, L.A., los angeles, Mercado Paloma, Mo-chica, Peruvian, Ricardo Zarate, South LA, Wabi Sabi. Bookmark the permalink.